Over 120 attendees and speakers gathered at the Hyatt Regency Tamaya Resort and Spa in New Mexico May 9-10 for the 8th PV Performance Modeling Collaborative Workshop. Participants came together to discuss PV performance modeling methods, practices, and standards; module and inverter performance characterization; solar resource data uncertainty; updates from application developers; advanced strategies for efficient PV plant operations and maintenance; and challenges and progress made towards new technologies. A Sandia-led project funded by the Grid Modernization Laboratory Consortium, has resulted in a multifaceted approach for utilities to better integrate distributed energy resources using modeling tools, advanced control strategies, and improvements to weather forecasting to mitigate the impacts of intermittent renewables. 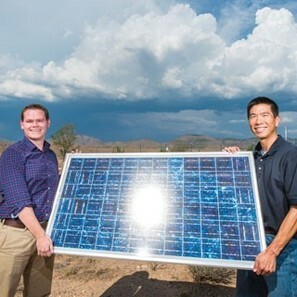 As a successful example of DOE's Tech-to-Market Initiative, Sims Industries has licensed Sandia Lab's Solar Glare Hazard Analysis Tool (SGHAT), which mitigates glare from solar energy installations while maximizing annual energy production by providing optimal tilt and orientation angles of the modules. 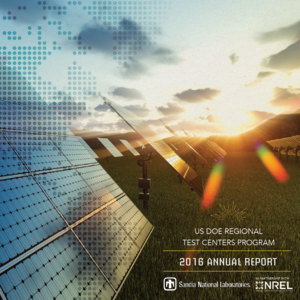 Sandia Labs has published a report outlining progress made during the past five years at DOE's five Regional Test Centers (RTCs). The RTCs are now working with more than 20 US companies to validate the performance of 42 different PV technologies, thus helping to strengthen the nation's energy economy. Lave, M., Broderick, R.J., Reno, M.J. Solar variability zones: Satellite-derived zones that represent high-frequency ground variability, Solar Energy, Volume 151, 15 July 2017, pp 119-128. Deboever, J., Zhang, X., Reno, M.J., Broderick, R.J., Grijalva, S., Therrien, F. (2017). Challenges in reducing the computational time of QSTS simulations for distribution system analysis. Albuquerque, NM, Sandia National Laboratories. SAND2017-5743. Stein, J.S., Burnham, L., and, Lave, M. (2017). One Year Performance Results for the Prism Solar Installation at the New Mexico Regional Test Center: Field Data from February 15, 2016 – February 14, 2017. Albuquerque, NM, Sandia National Laboratories. SAND2017-5872. Klise, G.T., Lavrova, O., Freeman, J.M. (2017). 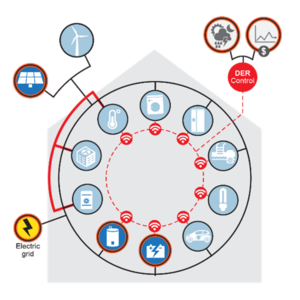 Validation of the PV-Reliability Performance Model in the System Advisor Model. SAND2017-3673. Stein, J. S. (2017). PV Performance Modeling Methods and Practices: Results from the 4th PV Performance Modeling Collaborative Workshop, International Energy Agency Photovoltaic Power Systems Programme. IEA-PVPS T13-06:2017: 95. Lave, M., Stein, J. S., Burnham, L., Performance Comparison of Stion CIGS Modules to Baseline Monocrystalline Modules at the New Mexico, Florida, and Vermont Regional Test Centers: January 2015-December 2016. SAND2017-0957.